When I was planning my wedding, I was laser-focused on finding the perfect dress. Going from bridal boutique to bridal boutique, I tried on countless options – until, finally, I found it! However, after my wedding, my dress has been sitting in my closet gathering dust. This got me thinking about where I can sell my wedding dress and recoup some of the cost. But where exactly can you sell a wedding dress? You may wonder how to sell your wedding dress and how much you can get for it. 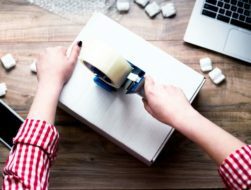 There are several different options – both online and locally – that will add a little more cash in your pocket and open up your closet space. When it comes to selling stuff online, the first option that may come to mind may be Craigslist or eBay. While those websites are great for selling certain items, wedding dresses and wedding-related stuff are not among them. Most people don’t go to eBay or Craigslist to search for a wedding dress, so it may take longer to sell it. Your best bet is to go with a niche-specific site that focuses on selling and reselling wedding-related items, including wedding dresses. These sites are targeted at women who are specifically looking for a second-hand wedding dress. Listing your dress on those websites will get it in front of an audience that is primed and ready to buy this specific item. When looking to sell your wedding dress, there are a few factors to consider. First of all, make sure your dress is in good condition without any tears, stains or other damage. Since you’ve only worn the dress once, it’s likely still in good condition. Also, keep in mind that photos sell. The more photos you can include of your dress from all different angles, the better. You can include both photos of you in the dress and the dress on a hanger but make sure to show any important details such as beadwork or a special lace design up close. Additionally, provide all information you have such as size, exact color (ivory, off-white, etc. ), petticoats, and so on. What Are The Top Sites to Sell Your Wedding Dresses? If you’re looking to make some cash by selling your wedding dress, check out the websites below. Many of them are specifically targeted toward brides looking to buy second-hand wedding-related items and save cash. Some of these websites also offer wedding dress consignment options if that’s something you’re considering. Still White bills itself as the world’s largest preowned wedding dress marketplace. According to their site, they’ve already sold $23 million and have a couple of good options for selling your dress. The website is straightforward and easy-to-navigate for both sellers and buyers. You have two options when listing your gown. Under the standard option, you’ll pay a one-time fee of $20 to list your dress. You’ll pay no commission on the sale, your dress will be listed until it’s sold, and you can upload up to four photos. The premium listing option comes with a $30 one-time fee, a homepage gallery feature, larger photo in search, and up to eight photos. Tradesy is an online marketplace for designer clothing and goods. In addition to everyday fashion, you can also sell your wedding dress via the platform. Creating a listing is simple and you can set your own price. However, keep in mind that if you want to sell your wedding dress on the site, it needs to be in excellent condition. One of the great things about Tradesy is that it guides you through every step of the listing process. You’ll also get suggestions to make your listings the best they can be so you can sell your dress quickly. As an added bonus, all uploaded photos will be automatically enhanced by Tradesy to make your listing stand out. For wedding dresses, once your item sells, you can print a prepaid label and ship using your own materials. If the buyer returns your item due to something that is not your fault, Tradesy will handle it and you get to keep your earnings. There are no upfront selling fees. However, you do have to pay a 19.8% commission on items sold for more than $50. Another great option for selling your wedding dress is Poshmark. It’s an app/website where you can sell your used clothes with a focus on designer brands. With the app, creating a listing is quick, simple – and free! Just take a few photos with your phone and upload them in less than 60 seconds. The app makes it easy to share your listings to your network for shoppers to discover. They offer custom filters and have a large selection of bridesmaid and wedding dresses. You can communicate with potential buyers within the app, making it easier to keep everything in one place. Once your dress sells, just print off the prepaid, pre-addressed label and either drop it in a mailbox or schedule a free pick-up. However, keep in mind that you’ll have to pay a 20% commission fee when you sell your wedding dress on Poshmark. If you’re looking for an option that will make the selling process hassle-free and don’t mind paying a higher commission rate, check out Nearly Newlywed. The listing process is quick and easy – just submit some information and photos of your wedding dress. Once your listing is approved, Nearly Newlywed takes it from there. They field buyer questions, handle payments, shipping, insurance, and so on. When your dress sells, you’ll receive a prepaid shipping label to send the gown to Nearly Newlywed for inspection and to verify its condition. Keep in mind that there’s a $25 listing fee and there’s no guarantee that your dress will be accepted. Nearly Newlywed also offers professional cleaning at highly discounted rates so you have the option to have them freshen it up before selling it. Once your dress sells, you’ll receive a payment for 60% of the sales price and the site keeps 40% as their commission. Wedding Bee is a website and an online community focused on providing advice, tips, and tricks to real couples planning on tying the knot. You can find information on topics such as DIY wedding projects, day-of tips, as well as dream wedding inspiration. But most importantly, the site also features a classifieds section where you can sell your wedding dress. It’s free to list your wedding dress on Wedding Bee and there are no membership fees to join. You set your own price and handle communications with interested buyers as well as shipping the dress. You can also list other wedding-related items such as shoes, accessories, decorations, and more. Wore It Once is a platform that connects buyers and sellers of used wedding dresses, gowns, jewelry, shoes, and other clothing items. You can sell your wedding dress by setting up your own custom shop where you can list other wedding-related items as well. When listing your dress, you’ll need to fill out a form with details such as size, color, and style. Then write a custom description for your dress and decide on a listing price. There’s a one-time setup fee of $20. However, currently, there’s no commission on the sale of any of your items. Your listings never expire and you set your own prices. There are also no limits on the number of products in your shop, so you can sell all your used wedding items! SmartBride Boutique is a free classifieds site where you can sell your wedding dress and other wedding-related items. In addition to your gown, you can list bridesmaids dresses, shoes, accessories, decorations, and more. There is no listing fee and no commission on any sales through the site. You’ll need to register for an account and fill out all relevant information, including the listing city. Add up to four photos to your listing to help attract more interest. If you’d like a few more features, you can select the premium listing package, which costs $4.95 per month. It includes extras such as featured item listing on the home page and on search results pages as well as data on how many times your item has been viewed and favored. Once Wed is an online wedding publication and resource for newly-engaged brides to find inspiration and tools to plan their dream wedding. And it’s also an online marketplace for second-hand wedding dresses. With more than ten years in the business and top rankings in Google, this site is a great option for selling your wedding dress. There is a listing fee of $19.95 per dress but other than that, there’s no commission. Your listing is valid for one year. The site offers seller privacy and protection along with customer service with email support to help you resolve any snags. Another option to sell your wedding dress is a website aptly named Sell My Wedding Dress. There are two options for listing your dress: a basic listing costs $19.99 and a premium one starts at $29.99, which includes a featured listing and better placement for your ad. The site does not charge any commission fees, and there are no hidden costs. Your listing will stay up until your dress sells. To list your dress, you’ll need to fill out some standard information such as the size, color, and style of your dress. You’ll also need to write a description and decide on a listing price. PreOwned Wedding Dresses has been in business since 2004. This site connects buyers and sellers of new, sample, and used wedding dresses and bridal party gowns. Thanks to the site’s number one Google ranking combined with ongoing advertising campaigns and strong social media presence, your dress will get in front of a large audience of qualified buyers. There’s a one-time listing fee of $25 but no commissions on the sale of your dress. The site also boasts high sell rates with their listings averaging more than 2,000 views and a sell time of roughly 70 days. They also have a handy wedding dress value calculator that will help you determine the best listing price. Where Can I Sell My Wedding Dress Locally? If you’re looking to sell your wedding dress locally, there are a few options. 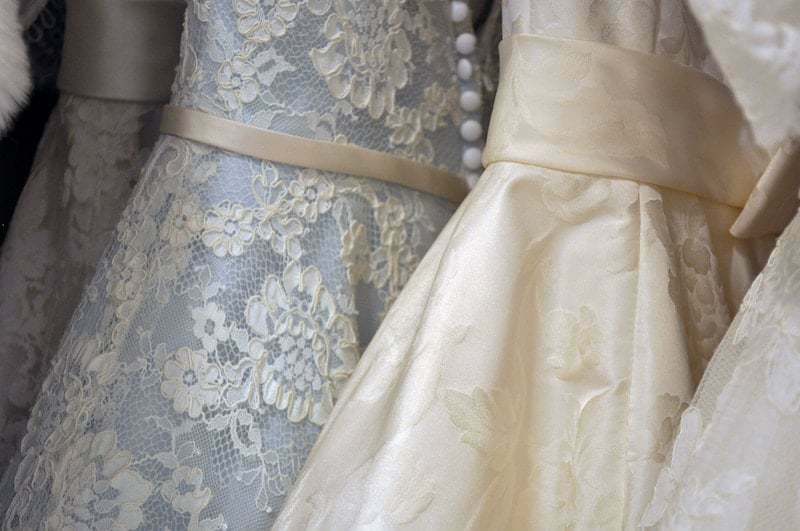 Your best bet if you’re looking to stay close to home are local wedding dress consignment shops. You can also try listing your gown on Craigslist or in Facebook buy/sell groups. Craigslist is an old standby for selling anything from furniture to children’s toys. It also has a section for selling wedding-related items including wedding gowns. While this may not be the best place to sell your wedding dress because it’s such a generic marketplace, it does have the perk of being local and free. Selling a wedding dress through Craigslist may take longer and it may be hard to find qualified buyers. Creating a listing is free but you do need to write a description for your dress and decide on a price. Keep in mind that many Craigslist buyers try to haggle, so set your price with a little wiggle room. While including photos with your listing is not required, it’ll attract more attention and make it more likely that you can sell your dress successfully. Another local option to sell your wedding dress is Facebook Buy and Sell groups. Just like with Craigslist, these are not niche-specific groups. You can sell anything from home decor to appliances on there, but the upside is that the buyers are local and you don’t have to worry about shipping your dress. Include lots of photos, a good description, and a competitive price when listing your dress. You may have to negotiate on the final price, so leave some bargaining room. It’ll probably take you longer to sell your dress via Facebook, but there are no fees to create a listing. Just make sure to follow the rules of the buy/sell group. 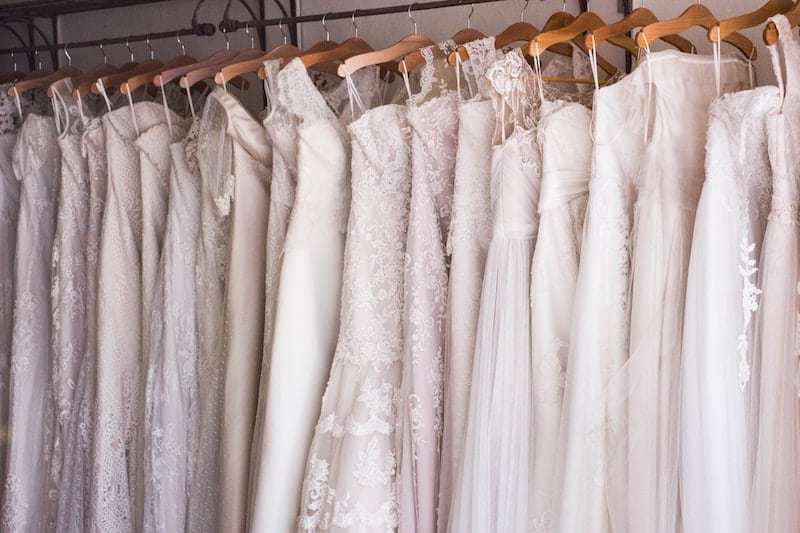 If you’re wondering, “Where can I sell my wedding dress locally?” the best option is a wedding dress consignment shop. 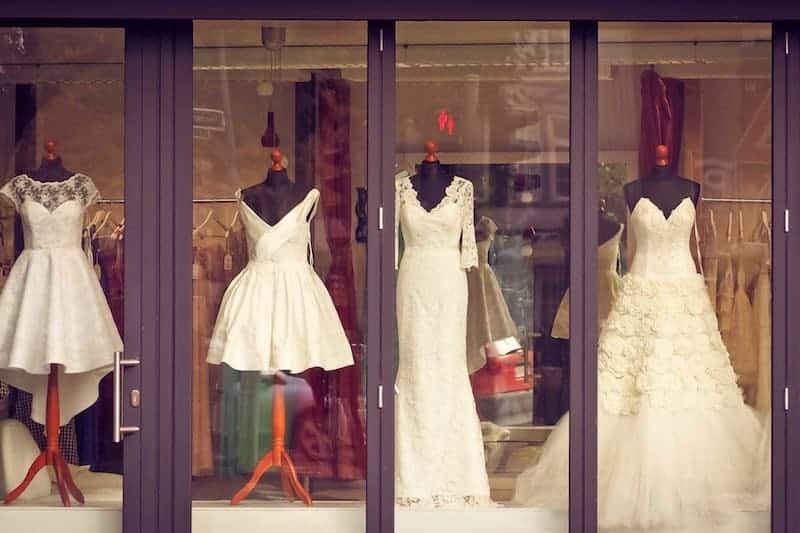 Since these shops specifically focus on selling wedding-related items, including wedding gowns, accessories, shoes, and more, this is your best chance for getting your dress in front of local buyers looking specifically for a wedding dress. One of the big downsides of local wedding dress consignment shops is that they charge pretty steep fees for helping you sell your wedding dress. Many shops charge a commission rate in the range of 40% to 60% of the final sale price of the dress. Taking such a big cut from the sale price may or may not be worth it to you for the convenience of selling locally. Now that you know where to sell your used wedding dress, let’s talk about the other questions on the top of your mind. How Much Can I Sell My Used Wedding Dress For? At this point, you may be thinking, “This is great and all, but how much can I sell my used wedding dress for?” The answer depends on a number of factors. As a general rule of thumb, a used wedding dress in great condition and under two years old can usually sell for 50% of retail price. If your dress is a designer brand such as Vera Wang, you can get closer to 60% of the retail value. There are websites out there that offer calculators to help you estimate how much you can get for your wedding dress. All you need to do is enter some general information such as your dress’s brand, condition, size, etc. and you can get a ballpark estimate of the value of your gown. The time it will take to sell your wedding dress depends on the brand, style, size, condition, and so on. Also, keep in mind that the popularity of the marketplace or store you select to use for your listing will also play a role in how much traffic your dress gets and how quickly it sells. On average, expect your dress to sell within 60 to 90 days provided it’s a popular brand and style, in excellent condition, and no more than a couple of years old. Dresses that are an older style, not in good condition, or are a lower-demand size may take longer to sell. Where Will You Sell Your Wedding Dress? There are many different options to choose from when you’re ready to sell your wedding dress. Online options on wedding-specific sites have the advantage of an audience of primed buyers who are actively searching for used wedding gowns. However, this also means dealing with shipping your dress and potential returns. Where you sell your dress really comes down to how much hassle you’re willing to go through to make a sale and whether you’re willing to pay an upfront selling fee or a commission. Finally, take into account if you’d rather go with a local buyer or if you’re willing to explore online options. Your turn: Have you decided how you want to sell your wedding dress? Will you go with an online platform or do you prefer to go local? Would you have tips for selling my never worn dress locally? I have people want to try it on more than actually wanting to buy it…Thanks!